Have you ever been carrying a bag full of groceries as a small hole in the bag was growing larger and larger? Perhaps the hole kept growing bigger until just before you got inside, the bag ripped and your canned fruit and vegetables flew everywhere. That scenario is a bit like what happens when your forklift chain isn’t properly maintained. The pins in your forklift chain are extremely important. The pins in the chain are what hold your entire load. Over time, those pins wear out. If your pins are wearing out and you’re either unaware or not addressing the issue, you’re playing roulette and your odds aren’t good. Dropping your groceries is bad. Dropping a 3,000 lb. load can be catastrophic. At the very least, when you suddenly drop thousands of pounds, you’re going to scare yourself and other people. Unfortunately, that usually isn’t the only outcome. If pedestrians are walking by when you drop a load, the outcome could be fatal. 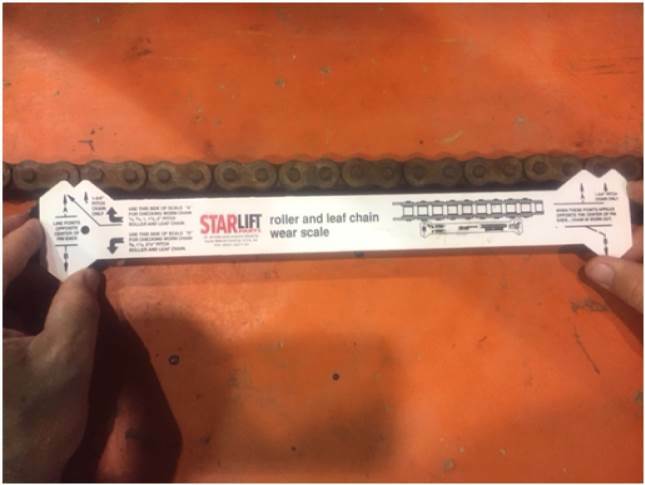 Fortunately, proper maintenance can help get ahead of old forklift chains before they break. Make planned maintenance a priority. Save your gambling for the casino, not the warehouse. 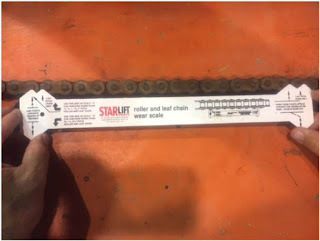 To get your forklift chains checked. We offer a free chain inspection and use an industry gauge for testing the chain and pins on your forklifts. The chain gauge gives immediate and visual feedback on whether your chains pass or fail. its was truly profitable. you're the best. Excuse Me, I have Work To Do!